Here is question I see all the time. 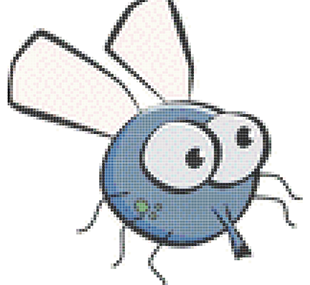 Which cross stitch software is best? 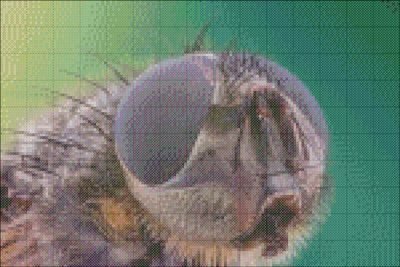 Well the answer is more complicated than that, so I’ll run a little demo here with PC Stitch Pro , Hobbyware Pattern Maker , Cross Stitch Platinum Plus, STOIK, KG Chart, PhotoPad, Pic2Pat, Thread-Bare, and StitchYourPhoto. I’m in a unique position to compare these software because I own so many different software, plus I like doing little comparisons. You can call it a bad habit. I’m a software addict. I actually own many more pieces of cross stitch software, but these are pretty popular choices, so we’ll compare with them today. 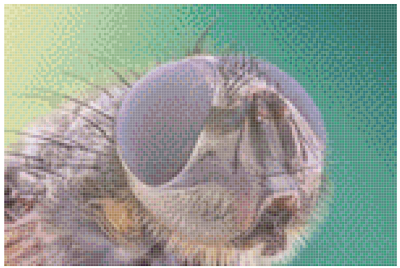 I’m going to use these two images of fly eyes. The one is rather simple and the other more complex with blending in background. I’m not going to edit or manipulate these in any manner. I will load them into the software creating a mockup 100 stitches wide for simpler image and 150 stitches wide for more complex. I use this software so I have no reason to talk badly about any of it. This will allow you to do the comparison for yourself. I have changed default settings in both Pattern Maker and Cross Stitch Platinum any changes from default I made were to change results for better. (I use these.) PC Stitch, I just upgraded to 11, so it was using fresh install with the default settings. I didn’t restrict number of colors at all for these comparisons. You may consider these biased if you would like, but I did try my best to be unbiased and just show results. Now, I’ll load them into PC Stitch first. Here are the mockup’s that come out directly from PC Stitch. A little review of PC Stitch. 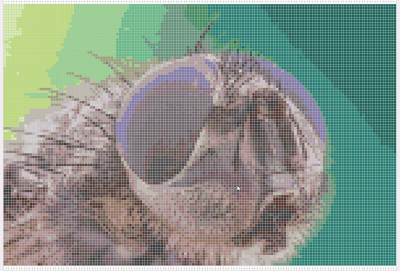 If you’ve never used cross stitch software and just want basic charts. This is the software I recommend the highest. It’s easy to use and relatively cheap. I really like the new update with PC Stitch 11. It’s really worth the cost of the upgrade. PC Stitch reads colors a little more pastel than they really are, so if you like bright vibrant colors you can expect your artwork to be slightly less. You should blow up the colors a little more vibrant in order to account for this not really glitch, but more reality of the software. All software uses different systems to match the colors. I really like their new system of showing stitched fonts. Now, I’ll load them into Pattern Maker. Here are the mockup’s that come out directly from Pattern Maker. A little review of Pattern Maker. This software was my favorite for a long time. 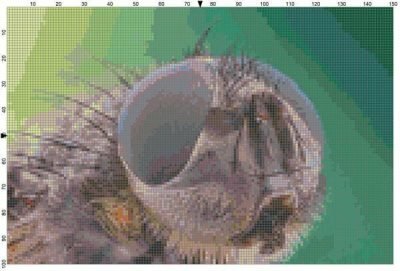 There are a lot of my charts created with this here on Advanced Cross Stitch. They however are not going to update this software any longer, so I have tried to veer away from them slightly. I’m so familiar with it though I sometimes find myself working with this still. I like it for fades best, but it’s color matching is slightly off in my opinion. I also correct for this software in Photoshop. I’ll load them into Cross Stitch Platinum. Here are the mockup’s that come out directly from Cross Stitch Platinum. A little review of Cross Stitch Platinum. This is my new favorite software, but it’s got the largest learning curve. If you aren’t good with computer software this option may be difficult for you. It’s not intuitive. They try to sell upgraded versions. I like that you can chart for machine embroidery machines as well though. I would love to see some of my charts machine embroidered. I’m working on getting a good machine for that. Here are the images out of KG Chart. I honestly have never used this software, KG Chart. I downloaded it just for this experiment because it was fairly highly rated on another site that I saw. So I used the free 30 day trial to create these images. I changed no settings. It does look pretty good from these though. I may purchase it just to check it out more. It’s a little concerning though that it hasn’t been updated since 2012, according to it’s file. So, maybe should wait and see what happens update wise with this one. I’ll load them into STOIK pattern software. Here is the mockup’s that come directly from STOIK. A little review of STOIK. Honestly, I’m surprised with how bad these come out. 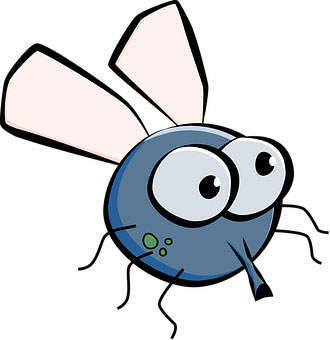 I like the ease of using this software and do use it sometimes. It’s probably the most user friendly of all the software that I have. It is also one that I got first, so the start of my software addiction. Here is PhotoPad by NCH Software. A little review of PhotoPad. It’s sort of confusing software because making charts isn’t it’s only options. It doesn’t have a lot of options though when it comes to creating charts. The editing is limited as well. It also doesn’t have a variety of symbols. You’ll have to watch your chart closely. It calls all stitching embroidery as well, so everything about it makes you feel like this is just a side thing that it does. 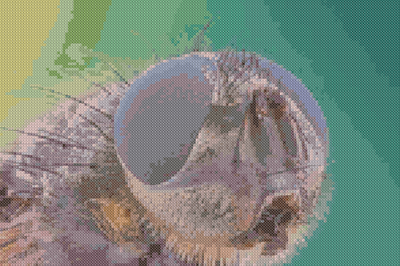 The chart quality seems okay for the smaller simple image, but way off for the bigger tougher image. Here is the free Pic2Pat option, loaded directly from site. These are a little different because it makes you select a full inch size and not number of stitches. These are closest as possible to others. I also don’t like this option for the ease of which you can break copyright laws. It’s law to get artist permission prior to stitching images and I’m a firm supporter of artists. I won’t budge on this even a little. Here is the results from the online software Thread-bare. This is online software similar to the free Pic2Pat. The difference is well… they charge you a lot of use their online software at $10 a chart. (You do the work, but you pay them too.) This company doesn’t verify image ownership either, so they allow copyright laws to be broken. I get compared to StitchYourPhoto.com a lot as well. This service charges $5 for the downloadable version of chart created. It’s almost always bad to see people use this service. You can see the low quality of it just from these almost perfect images. I would never recommend this software. It also charges you for the patterns which makes it even worse. So there you have just generic image loaded and you can see that there is a difference. I personally prefer using different pieces of software based on what the customer is wanting or what my goal for the chart is. What I did here is nothing like what my service is for custom charts. I edit your image to make it as close to ideal for whatever software I use in the end. My service is completely customized to your wants and needs for the piece you want to create. There is a lot more to getting a great chart than just putting image into the software, but as you can see you’ll get pretty good results if your image going in is fairly clear like these ones are. If your images have even the slightest areas that aren’t perfectly clear, these software options aren’t your best option. I will work to clean up your image and either eliminate it or edit image to reduce emphasis on areas less desirable to the eye. I provide free mockups to show you what your stitching will look like as well, so there is no obligation if you aren’t completely happy with the way the chart will look. Since you made it reading this far, maybe you would like to read some other reviews from publications. I’m trying to collect these so they can all be found in one spot. Let me know what you thought of the comparisons?